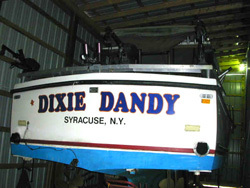 The Dixie Dandy has been hauled from the water and is snuggled into her winter berth in the main building at Mike's Marina. Once again our 31' JC has performed well and now deserves a few months rest. As we do every off season general preventive maintenance procedures will be carried out. 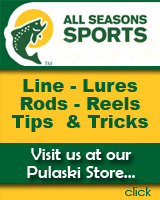 The wear and tear associated with our "fish every day" season schedule requires an absolute commitment to insuring our vessel is fine tuned to the rigors waiting in the form of the 2008 season. Simply put, our customers deserve the best. <?xml:namespace prefix = st1 />Lake Ontario waters, like all of the Great Lakes are extremely low. In fact I had to wait for favorable north winds to raise the water a few inches in the Little Salmon River before I could navigate the boat to its berth at my summer cottage prior to haul out. We touched bottom a couple of times on our way up river with no harm done, thanks to Dixie Dandy's sizeable keel. We need rain and snow and lots of it to build a base for a good flow of water in the spring. 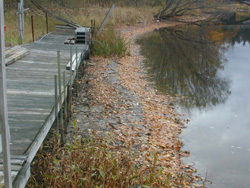 The low water situation in each of the Great Lakes is a very real problem. I hope we get plenty of snow in "them thar hills" especially while I am fishing in Georgia and Florida this winter. This record low water thing has made it difficult for salmon to complete their migration to the hatchery. While tons of fish returned to the Salmon River, extremely low water, warm weather, and plenty of efficient anglers took their toll. As such fewer fish reached the hatchery. The annual stocking goal for Chinooks is 1,800,000 fingerlings. As of early November the hatchery has cultivated a little over 2,000,000 eggs. NY DEC fishery personnel are currently taking salmon from other Lake Ontario tributaries to help meet planned goals, which is generally a harvest of over 3,000,000 eggs. We move a little closer each day and I anticipate we will close in on the harvest numbers from previous years. I will be attending the Lake Ontario Stakeholders meeting in early December where I will receive the final egg count numbers. 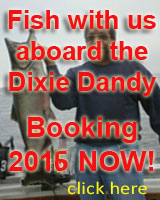 In addition the group will be working with DEC to assure that our fishery remains healthy for years to come. On another interesting note, the hatchery has already harvested plenty of Coho eggs and could increase Coho stocking numbers to supplement a Chinook shortfall if this should become necessary. Catching more of the speedy "silvers" would be terrific. 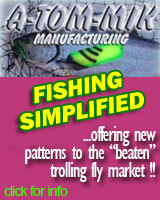 A huge advantage a stocking program has over a totally wild fishery which is most susceptible to the whims of nature is the ability to make adjustments. Flexibility is the key to success. We should be wary of "wild fish only" methodology proposals for Lake Ontarioâ€™s future as they usually produce "boom or bust" fish population cycles. It looks like the DEC will be ordering a truly state of the art fish marking system which is housed in a mobile over the road configuration. The system is capable of marking 60,000 fish in an eight hour period. This is going to allow us to determine just how many wild fish are returning to the tributary streams. We know that millions are naturally spawned each year but we are not sure how many reach adulthood. The new system will provide the answer. How do you maintain the world class status of the Lake Ontario fishery? Well, employing state of the art equipment is a big part of the effort. "I Love New York," you bet I do.